“… a must…” Canada’s History (formerly the beaver). 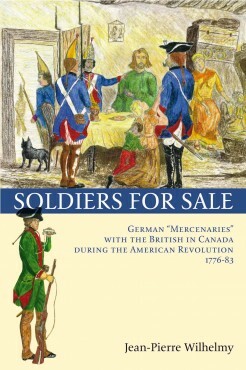 The British Army that fought the American Revolutionaries was in fact an Anglo-German army. Britain was unsure of the commitment of English soldiers to fight other English-speaking people and also doubted the loyalty of the Canadiens whom it had recently conquered when it took control of New France. King George III thus turned to his relatives the princes of German states to obtain the much-needed troops in return for large amounts of money. Some German princes even complained that not enough soldiers were dying which meant less money for them. Known in the United States the Hessians, many of these soldiers, were dragged unwillingly from their families and sent to fight in a war on a remote continent that didn’t concern them. A large number of them remained in Canada after the war and melted into the French and English-speaking societies. This is their story, which was largely unknown even to their own descendants until Jean-Pierre Wilhelmy wrote this book. Prefaces by the late Marcel Trudel and Virginia Easley DeMarce, Ph.D. The following excerpt of a letter from Landgrave (count) Frederick II of Hesse-Cassel shows that the real mercenaries were the princes who sold the German soldiers. “… a must… if you’re interested in early Canadian history–and especially if your name is Albus, Koch or Ziegler– then this is a book for you.” Mark Reid, Canada’s History (formerly The Beaver), Aug. 2012. Marcel Trudel (1917-2011) was Emeritus Professor of History at the University of Ottawa. He published more than 40 books on the history of New France and won many awards, including the Order of Canada and the Ordre national du Québec. Virginia Easley DeMarce is a historian who specializes in early modern European history. She has a Ph.D. from Stanford University in 1967. She taught at the college level for fifteen years, at Northwest Missouri State University, and George Mason University and published a book on German military settlers in Canada after the American Revolution. A past president of the National Genealogical Society, Ms DeMarce has written or co-authored a number of formative short stories and novels in the 1632 series collaborative fiction project.